We’d love your help. 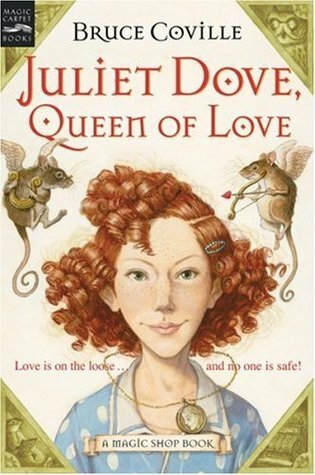 Let us know what’s wrong with this preview of Juliet Dove, Queen of Love by Bruce Coville. Shy Juliet Dove leaves Mr. Elives' magic shop with Helen of Troy's amulet--a virtual man magnet. Juliet doesn't know what she's got, but soon every boy in town is swoony for her. Yet, much as she'd like to lose all the unwanted attention, she can't: The amulet won't come off! A sidesplittingly funny, heartbreaking whirlwind of a book about the high cost of loving, from the Shy Juliet Dove leaves Mr. Elives' magic shop with Helen of Troy's amulet--a virtual man magnet. Juliet doesn't know what she's got, but soon every boy in town is swoony for her. Yet, much as she'd like to lose all the unwanted attention, she can't: The amulet won't come off! A sidesplittingly funny, heartbreaking whirlwind of a book about the high cost of loving, from the award-winning author of My Teacher Is an Alien and The Unicorn Chronicles. To ask other readers questions about Juliet Dove, Queen of Love, please sign up. Somehow I managed to pick up a book which turned out to be a fifth-in-the-series. No idea that it wasn't the very first book, I quite enjoyed the story, actually. It really highlights how good children novels and is a stark contrast to nowadays YA novels. It's got elements of magic, humour and love just as much as most teen novels. Granted, the diction is less sophisticated but it doesn't take away how good this book was (even though I read this in grade 6). What I am really trying to say here is Somehow I managed to pick up a book which turned out to be a fifth-in-the-series. No idea that it wasn't the very first book, I quite enjoyed the story, actually. It really highlights how good children novels and is a stark contrast to nowadays YA novels. It's got elements of magic, humour and love just as much as most teen novels. Granted, the diction is less sophisticated but it doesn't take away how good this book was (even though I read this in grade 6). I listened to this on audiobook, and I think that really made a difference to the story, hearing an entire cast of characters reading the dialogue. There was so much acting and expression put into every sentence that it made the story really come alive! This is the tale of Juliet, who is a shy young teen with a literary and artistic family. When a mysterious woman gives her an enchanted amulet, every boy in town starts to fall in love with her. It's up to Juliet and her new rodent friends from th I listened to this on audiobook, and I think that really made a difference to the story, hearing an entire cast of characters reading the dialogue. There was so much acting and expression put into every sentence that it made the story really come alive! This is the tale of Juliet, who is a shy young teen with a literary and artistic family. When a mysterious woman gives her an enchanted amulet, every boy in town starts to fall in love with her. 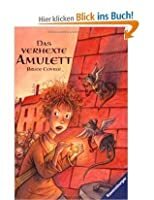 It's up to Juliet and her new rodent friends from the Magic Shop to unravel the mystery of the amulet, and get Juliet out of the ancient love story she is doomed to relive. First of all, I love stories that bring in the old Greek gods into modern settings (because of Percy Jackson). Secondly, I love stories with wise-cracking rats or mice. And thirdly, I love stories with strong family relationships with both a mother and father present and involved and actually parenting (instead of dead, divorced, or absent). Juliet is a beautifully complex character who is NOT your stereotypical "shy person." She is shy, but that is not ALL she is. And her painful shyness sometimes makes her react in unexpected ways. Like most shy people, she is terribly misunderstood, and her relationships with others are strained because of that. It was wonderful to see her growing and dealing with her fears. She's incredibly intelligent and witty and altogether delightful! My favorite character by far was Mr. Toe, the imaginary friend of Juliet's baby sister, Clarice. When asked if he is a pinky toe, Clarice responds that he is a big. The many references to the invisible Mr. Toe made me laugh my head off! It was the perfect addition to this quirky and magical story. Mr. Toe likes to write letters. Mr. Toe only shakes hands with the neighbor boy and no one else. Mr. Toe will eat the vegetables that Clarice doesn't like. As for his appearance (other than being a toe) Mr. Toe stands a foot tall, but whether or not he has eyes is an enigma. haha! Oh, it's so adorable! My second favorite characters are the rat duo, Jerome and Roxanne. Those two have the snappiest dialogue and great little one-liners! I love how courageous and full of fun they are, and how sensitive they are to Juliet's needs. They stick by her through thick and thin, and show some street smarts within the world of magic too. Their origin story is weird and wacky, and they are hilarious! I like the writing; it's humorous and filled with great dialogue! The plot moves along wonderfully, with a supporting cast of interesting characters. There are several levels to the story happening at once, so it gives the plot some depth. It's just good writing! Meh. It had its cute stuff, but again the “back story” bogged down. This one was more “mysterious” than the others, what with not knowing who gave what to Juliet, or why. I don’t know, I just didn’t really care. I almost didn’t finish but that would be silly because it is so short and it’s the last book of the series. It would bug me more to NOT finish it then it did to just blaze through. And all the boys seem pretty cool with the fact that they were all under a love spell. And that there were Meh. It had its cute stuff, but again the “back story” bogged down. This one was more “mysterious” than the others, what with not knowing who gave what to Juliet, or why. I don’t know, I just didn’t really care. I almost didn’t finish but that would be silly because it is so short and it’s the last book of the series. It would bug me more to NOT finish it then it did to just blaze through. And all the boys seem pretty cool with the fact that they were all under a love spell. And that there were talking rats with wings around. No big deal, happens every day apparently. This story started out slow the first 20 pages and then it picked up and the ending is great. There are flying rats, gods and goddesses and poetry readings all packed into this story. A the center piece of this story, fitting for anything dealing with poetry is love. Juliet is a girl not looking for love or attention. She has to learn to deal with those things. A nice little story. A good story. I highly enjoy the Magic Shop series and when i found out there was a 5th book i jumped at it. This one is different to the others in a number of ways which made it special in itself. Jerome and Roxanne have much bigger parts to play which in itself made it interesting as they always seem to be such big characters in small bodies. Juliet in herself is a quiet red head which reverberated within this red heads soul as to what I found it to be like in school. Quiet and different is not always a goo I highly enjoy the Magic Shop series and when i found out there was a 5th book i jumped at it. This one is different to the others in a number of ways which made it special in itself. Jerome and Roxanne have much bigger parts to play which in itself made it interesting as they always seem to be such big characters in small bodies. Juliet in herself is a quiet red head which reverberated within this red heads soul as to what I found it to be like in school. Quiet and different is not always a good thing. However you can see her grow in herself throughout the book as a quest is forced upon her. Juliet Dove doesn't have many friends. Although no one at school would believe it, she's painfully shy. So shy, in fact, that she uses sharp words to keep others from paying attention to her (which is how she's earned the nickname "Killer"). One day when running away from two girls at school, Juliet finds herself at the Magic Shop and she's drawn to a beautiful amulet. When the lady at the shop gives it to her, Juliet is surprised, but pleased. But when she puts it on, she discovers something st Juliet Dove doesn't have many friends. Although no one at school would believe it, she's painfully shy. So shy, in fact, that she uses sharp words to keep others from paying attention to her (which is how she's earned the nickname "Killer"). One day when running away from two girls at school, Juliet finds herself at the Magic Shop and she's drawn to a beautiful amulet. When the lady at the shop gives it to her, Juliet is surprised, but pleased. But when she puts it on, she discovers something strange happening. First, her best friend Arturo seems to be paying more attention to her looks and he's saying strange things to her. Then she notices all the boys at school seem suddenly smitten with her... Juliet discovers that the locket she's been given was previously owned by Helen of Troy, there's some powerful magic at work in it, and she can't take it off. With the help of a couple of enchanted rats, Juliet must break the spell that the necklace has put on her... before it's too late. I stopped listening to the audio after cd2. It's good, but couldn't get into it. 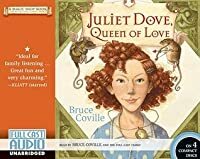 Grade 4-7–Bruce Coville returns to Mr. Elives' Magic Shop in this story of Juliet Dove, a shy middle school girl who suddenly finds herself the center of attention (Harcourt, 2003). While running away from some teasing girls, Juliet stumbles on the moveable magic shop, but instead of Mr. Elives, a mysterious woman is minding the shop. The woman, who turns out to be Eris, goddess of discord, offers Juliet a necklace I stopped listening to the audio after cd2. It's good, but couldn't get into it. Grade 4-7–Bruce Coville returns to Mr. Elives' Magic Shop in this story of Juliet Dove, a shy middle school girl who suddenly finds herself the center of attention (Harcourt, 2003). While running away from some teasing girls, Juliet stumbles on the moveable magic shop, but instead of Mr. Elives, a mysterious woman is minding the shop. The woman, who turns out to be Eris, goddess of discord, offers Juliet a necklace and the trouble begins. Lovesick boys start fighting over her and camping out on her front lawn, mysterious women show up in the garden, and two talking rats appear to help her solve the mystery of the amulet. Juliet can't talk to anyone about the amulet and can't take it off. This full cast recording of the most recent title in the Magic Shop series features Coville as the narrator and 24 actors taking 29 roles. The voices are distinctive and well acted, from the children to the gods, bringing all the characters to life. Although humor abounds, the story also deals with important topics such as self-image and how we treat others. This tale of magic, myth, and personal development will hold the attention of upper elementary and middle school students. Great Aunt Bessie had "the face of an angel and the heart of a pirate." "Mrs. Dove volunteered at the Venus Harbor Library two afternoons a week, and she loved bringing other workers home with her." "The Dove family had a hard time keeping track of Margaret's hair colors." "Juliet, I'd like you to meet Hyacinth Priest. She's in town for a few weeks to teach a storytelling class at the library." Yes, slugs rock because they have the courage to travel without their shells! Loved Margaret. coolest older sister I've ever read. Loved the whole family. Loved the parents' jobs - poetry professor at college and comic book writer who bases her characters on her family members. As a freelancer who works from home, I especially resonated with Mrs. Dove's character who also works from home in her 'Dovecote' where the children can also come in to draw beside their mother while she works. The book said that this offered them time to be together and bond while still working on their own projects. This is practically my dream life I think! "Be wise. Let go of fear, and act out of love." by Athena. "It was as if in asking the question, "What do you love?" she had been forced to answer it herself. A tidal wave of love had washed through her-love for her family, for her home, for Venus Harbo, for Queen Baboo, for the little details of her life, the flowers in the backyard. the always present smell of the sea air, even the ridiculous sluggarium. And under all that was an even more astonishing idea, one that fairly staggered her. It reminded me of Primrose's love for her town, Pearl Harbor, in my favorite book of all time, "Everything on a Waffle" by Polly Horvath. It reminded me of Meg's love for her little brother Charles Wallace in "A Wrinkle in Time" by Madeline L'Engle. It reminded me of why Harry was able to win over Voldemort ("Love, Harry, love." -Professor Dumbledore). It also brought back Clarissa Dalloway's love for the bustle of an ordinary day in the streets of London, for the trees, the automobiles, the pedestrians going about their own business, for life in general. Moments like these, they remind me of why I love to read children's books so much. I reread the book the moment I finished it. I have inherited a half grown "grand-daughter" recently, who has discovered reading. I spent several hours at the thrift store using Goodreads.com as my guide to help me find appropriate books for her age, interests, and my standards for her, hoping to feed her interest. I think I hit on a winner with this one. I'm only giving it a 4 because I have not read many 10-13 year old books, since I was 10-13 yrs old myself 45 years ago, SO this is my foundational standard setting book. It was entertain I have inherited a half grown "grand-daughter" recently, who has discovered reading. I spent several hours at the thrift store using Goodreads.com as my guide to help me find appropriate books for her age, interests, and my standards for her, hoping to feed her interest. I think I hit on a winner with this one. I'm only giving it a 4 because I have not read many 10-13 year old books, since I was 10-13 yrs old myself 45 years ago, SO this is my foundational standard setting book. It was entertaining, quick paced and felt comfortable to me to read and enjoy. I had to tell my self to quit focusing on developing character and wanting more detail because it is not my reading level. There were places I wanted to underline profound thoughts for my grand-daughter like this one on page 84 when a character shares some insight about stories beginning and ending like this "But the story starts before that. Actually the story starts, as all stories do in their way, with the beginnings of the world, for in that time were spun threads that stretch forward to this very moment. Take anything in the now, and if you have the eyes to follow it, it can lead you all the way back to the beginning." There were other places I would like to know if she understands, maybe have my own book club with her. Book five of the Magic Shop series is almost a Midas theme in the sense not of touch but getting what you desire may be more dangerous than you would think. Average story here with some prudent points to make. Love the full cast audio. Bruce Coville will has reader laughing out loud and rushing to read what will happen next. One of our family's favorites. A great choice for every child's bookshelf. I remember loving Bruce Coville's books when I was young. I'd never read this one before, so I thought I'd give it a shot when I found a copy of it second hand. It was enjoyable, and even though it's part of a series, it stands well on its own. I've never read any of the other books, and if it hadn't been for the "A Magic Shop Book" note on the cover, I probably never would have realized it was part of a series. Have you ever been in love. If you have, then you should read this book called "Juliet Dove, Queen of Love" that's about a girl that makes any boy she meets fall in love with her. The story takes place in a school, and Elive's Magic Supplies S. H. Elives, Prop. where the main character named Juliet Dove gets bullied by these girls named Bambi and Samantha. Later, when Samantha threatens to slap Juliet because of what she said to Bambi, Juliet tries to run as far away as she can from her until s Have you ever been in love. If you have, then you should read this book called "Juliet Dove, Queen of Love" that's about a girl that makes any boy she meets fall in love with her. The story takes place in a school, and Elive's Magic Supplies S. H. Elives, Prop. where the main character named Juliet Dove gets bullied by these girls named Bambi and Samantha. Later, when Samantha threatens to slap Juliet because of what she said to Bambi, Juliet tries to run as far away as she can from her until she sees a shop named "Elive's Magic Supplies S. H. Elives Prop." When Juliet enters the shop, she meets Iris. Iris then shows Juliet this precious amulet. Juliet wanted that amulet so bad, but Iris told her that it was not for sale. The amulet then started to feel warm and strange in Juliet's hand. Then Iris stated that Juliet might be the one to where the amulet. I was surprised when Juliet saw two rats named Roxanne and Jerome talking to her because rats can't talk. The main character's problem is that Juliet can't take off the amulet. Juliet was impatient and desperate to take off the amulet. I was surprised when Ms. Priest, Mr. Elives, and Juliet bowed their heads as Aphrodite stepped from shell to shore. Juliet now understood the last piece of the puzzle after Hera told her that. Then, when Aphrodite came to place her hand in front o Juliet's chest, the amulet then came off of Juliet. I was surprised when Cupid stepped out of the door from the amulet because Aphrodite was her mother and she prisoned her own son into that amulet. Aphrodite then asked her son if he could forgive her, and he did. In conclusion, I would rate the book on a scale 1-5 because it includes 3 Greek gods, and it's an amazing and an adventurous book I had ever read. I would recommend this book to people who like Greek Mythology. If you ever meet someone who likes reading love books, then you should tell them to read this wonderful book. Haarasin selle raamatu Paavli kaltsukast 30 eurosendi eest. Kaanepilt oli ilus ja hakkas silma, rahast ka kahju polnud ja nii ta mulle koju rändas. Lugedes avastasin, et ka sees on imelised illustratsioonid, mis loole lisaväärtuse andsid. Ma ei mäletagi millal ma viimati piltidega raamatut lugesin. Annaks 0,5 tähekest nende eest juurdegi. Muidugi oli vahva kodus avastada, et tegu on sarja viienda raamatuga. Lugemist ei häirinud see pisiasi aga mitte üks teps. Ilmselt on seeria fännid lihtsalt võ Haarasin selle raamatu Paavli kaltsukast 30 eurosendi eest. Kaanepilt oli ilus ja hakkas silma, rahast ka kahju polnud ja nii ta mulle koju rändas. Lugedes avastasin, et ka sees on imelised illustratsioonid, mis loole lisaväärtuse andsid. Ma ei mäletagi millal ma viimati piltidega raamatut lugesin. Annaks 0,5 tähekest nende eest juurdegi. Muidugi oli vahva kodus avastada, et tegu on sarja viienda raamatuga. Lugemist ei häirinud see pisiasi aga mitte üks teps. Ilmselt on seeria fännid lihtsalt võlupoega, mille ümber tegevus toimub, rohkem kursis. Peategelane Juliet Dove on äärmiselt arg tüdruk, kes üritab tähelepanu igati vältida. Nii kipub ta inimestele üsna halvasti ütlema ja sõpru tal seega väga pole. Peale klassiõele nähvamist on tüdruk sunnitud põgenema ja satub võlupoodi. Leti tagant ilmub välja noor naine ja annab talle amuleti. Kui Juliet selle hiljem kodus kaela paneb, siis avastab ta peagi, et seda ei saa kaelast ära ning äkitselt on ta kõigi noormeeste tähelepanu keskpunktis. Raamat oli lihtne, lustakas ja maagiline. Tegevus oli hoogne ja mingit venitamist küll ei olnud. Pigem tundus mulle, et liiga palju on ~250 lehe sisse pressitud. Oli tavalist tänapäeva elu, lisaks võluvärk ja veel Kreeka/Rooma jumalad. Kui muidu ma valmis fantaasiat järjest ahmima, siis selle teose puhul oleks tahtnud rohkem kuulda Julieti sekeldustest poistega, mitte retkedest teistesse reaalsustesse. This review has been hidden because it contains spoilers. To view it, click here. Juliet Dove is a painfully shy girl with a habit of making venomous remarks to people who tease her. She doesn't mean to, it's just the only way she can get people to leave her alone. She accidently wanders into Mr. Elives’s magic shop, where a strange woman gives her an amulet. Suddenly every boy who sees her falls instantly in love with her. For Juliet, this is a living nightmare, since her shyness makes her so uncomfortable around people. Next, two talking rats, Jerome and Roxanne, show up. I Juliet Dove is a painfully shy girl with a habit of making venomous remarks to people who tease her. She doesn't mean to, it's just the only way she can get people to leave her alone. She accidently wanders into Mr. Elives’s magic shop, where a strange woman gives her an amulet. Suddenly every boy who sees her falls instantly in love with her. For Juliet, this is a living nightmare, since her shyness makes her so uncomfortable around people. Next, two talking rats, Jerome and Roxanne, show up. It turns out that Mr. Elives has no idea who gave her the amulet and it could be dangerous. They offer to take the amulet, but Juliet can't take it off. In order to get the necklace off she's going to have to find a key and tangle with four Greek goddesses. Her younger siblings pitch in, and with some unexpected friends, they manage to defeat Eris, the goddess of discord. I’ve seen this book in the library growing up, but never was interested. My friend recommended it to me, so I decided to give it a go. It was a very fun light-hearted read. Jerome and Roxanne, the rats, were great. Not only did they provide good comic relief, they were also essential characters for the story. And I loved that Juliet’s siblings got involved and helped her solve the problem. Juliet Dove, Queen of Love is the second magic shop book that I have read. It is good, but will not make my favorites list. I thought the story was cute, but it just wasn't what I enjoy reading about. Basically, it felt like I was reading a romance novel with some magic thrown in. Juliet comes across the magic shop, but it isn't Mr. Elives she runs into, but some woman who ends up giving her a locket. When Juliet finally puts in on she can't get it off, and then a huge fiasco ensues. She spends a long time trying to figure out how to get it off, while having to deal with hordes of boys following her around because they can't help but falling in love with her (thanks to the locket). Not my favorite story and I almost feel like it may be a little inappropriate for younger readers. I definitely liked the characters more than the story, which was good otherwise I wouldn't have enjoyed the book as much. I love Juliet's sister! She is so cute and has the funniest imaginary friend. There are also some very interesting rats, Roxanne and Jerome, who are rather enjoyable characters. As well as the many different Greek Gods/Goddesses that Juliet meets on her adventures. Overall, I did enjoy the book, but it definitely wasn't one of my favorites. If you enjoy more romance in your novels than this is a great book for you! So this is the guy who wrote "My Teacher is an Alien," huh? Ha ha! This is the first book I've read by him. This was a light read. I wish it wouldn't have been so light. If it was deeper I think my affinity for the book would feel much more justified. Regarding the Full Cast audiobook, it is So this is the guy who wrote "My Teacher is an Alien," huh? Ha ha! This is the first book I've read by him. Regarding the Full Cast audiobook, it is enjoyable. Incidental music, full voice cast, but no score or sound effects, for what that's worth. The voice acting is decent, and even the kids are pretty good. I really appreciate that Bruce Coville does more than just produce an audiobook with a single narrator. His Full Cast Audio company has also done adaptations of other things like a couple books by Lloyd Alexander and the Book of Job. Until buying this book for a few cents at a library sale, I hadn't ever read a book by Bruce Coville. Or read the previous books as I recently found this was fifth in a series. At first I didn't think too much of it, I thought for 50 cents it would be a okay, quick read. It was actually better then I thought, the writing style wasn't as detailed as I'm used to with novels, but it still gave enough information to imagine the situation in your head like a movie while keeping it easy to read. I quit Until buying this book for a few cents at a library sale, I hadn't ever read a book by Bruce Coville. Or read the previous books as I recently found this was fifth in a series. Summary (CIP): A shy twelve-year-old girl must solve a puzzle involving characters from Greek mythology to free herself from a spell which makes her irresistible to boys. Review: It was fun to listen to the FullCast audio, but the voices of the rat characters were irritating to the point of distraction. I thought that shy Juliet was a relatable character, and I found the rest of her family to be quirky but real. I enjoyed the integration of mythology into the mystery. Positive Horn Book Revewiew, "The lighthearted fantasy will entertain fans of the popular series." SLJ reviewed the audiobook calling the voices "destinctive and well acted". Mr. Elives' magic shop comes and goes. This time it appears in front of Juliet Dove as she is trying to escape from some classmates. Inside, a strange woman dangles an amulet in front of Juliet until she is tempted and takes it from the woman's hand. Suddenly, Juliet finds herself at the center of a widening circle of lovesick boys and for a shy, quiet girl like Juliet, this is not a good thing. When two smart-alecky and talking rats arrive to help her unravel the puzzle of the amulet, Juliet kno Mr. Elives' magic shop comes and goes. This time it appears in front of Juliet Dove as she is trying to escape from some classmates. Inside, a strange woman dangles an amulet in front of Juliet until she is tempted and takes it from the woman's hand. Suddenly, Juliet finds herself at the center of a widening circle of lovesick boys and for a shy, quiet girl like Juliet, this is not a good thing.